Sometimes things aren't clear right away. That's where you need to be patient and persevere and see where things lead. - Mary Pierce - Gateway to Canada | Canada Immigration Consultancy! It was June 2007 when Ms. Veralynne Alcantara, Medical Laboratory Technologist, first visited Canadian Immigration Consultancy office to inquire about immigrating to Canada. She immediately started her application and her application was filed right away under the Federal Skilled Workers Program. But changes were introduced in 2008 and her application was affected. Her application was returned unprocessed. Immigration rules change from time to time. Just look at the Chronicle of Changes in the Canadian Immigration and Regulations from 1992 to 2008 and you will get an idea. And from 2008 to present, there were series of changes as well. From the time her application was returned, it was only in 2013 that she became eligible. A limited number of applications from selected occupations were accepted in 2013, including Medical Laboratory Technologist. Because she was ready with the documents, her application was immediately filed and she made it to the quota. Although her application was approved shortly after filing the application, it took a while before she got her visa due to some issues with some of her documents. But with Canadian Immigration Consultancy's assistance, those issues were addressed properly. 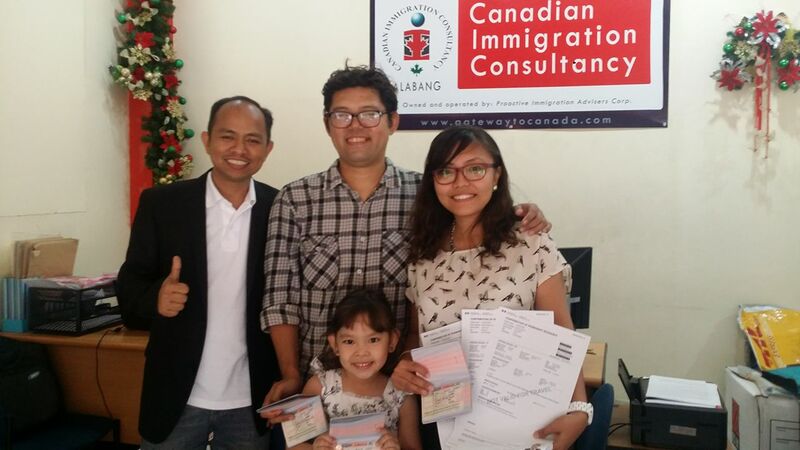 She recently received her visa together with her dependents and gamely obliged for a testimonial photo at Canadian Immigration Consultancy Alabang Office. Ms. Veralynne Alcantara is now Mrs Veralynne Carandang, married and with a lovely daughter. They will be moving to Canada this coming March 2016. Interested to live and work in Canada? Take our Free Online Assessment or schedule an appointment for orientation. Check out our Orientation/Seminar Schedules.